Think some of our inflatables are large? Think again. The world’s largest moon bounce is heading over to Sacramento, California as part of the Ridiculous Obstacle Challenge. 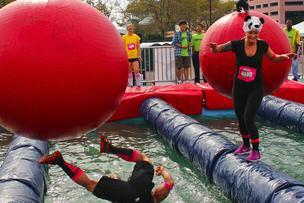 The 5k race, which features ten to twelve obstacles, which include a wrecking ball and a giant water slide will debut this upcoming September 6th at the Cal Expo. If you are thinking to yourself, this sounds exactly like the TV show Wipeout, you are right on the money. The Ridiculous Obstacle Challenge, which is inspired by the hit television show, will be held in a handful of cities across the United States and Canada. Benefiting the Challenged Athletes Foundation, the event is opened to everyone thirteen and older.